Unlike any yoga mat on the market DIMENSIONS. 183 x 63 cm. Large size fits most body types. CLEANING. Wipe down with sponge and soapy water after each use. Wash by hand, not machine. Store rolled up and in bag. Avoid sunlight when not in use. MATERIAL. 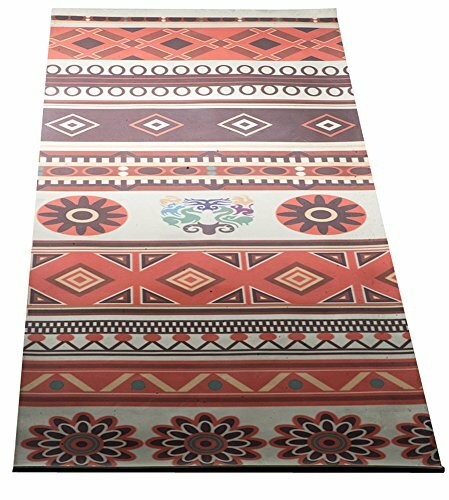 Constructed with soft-to-touch latex, this premium YOGA MAT holds its bold color and design for years to come. Simply hand wash, and keep in cool dry place, and this MAT will continue to inspire and excite you, every time you workout. LUXURY YOGA MAT. Our uniquely designed YOGA MAT lets you lie in luxury, every time. Perfectly blends bright colorful flowers with vibrant geometric shapes. Soothes and uplifts your spirit as you work out. Latex material maintains long life of brilliant color. Whether you use your mat for yoga, barre, weightlifting, or meditation, you will be the envy of all fellow fitness fanatics. Stand out in the crowd, feel absolutely rich and beautiful. SOFT TOUCH. You will never find another YOGA MAT quite like this. Our engineers have worked long and hard to create the softest, most plush YOGA MAT you have ever experienced. Like no other...gentle to the touch, this deluxe latex MAT feels unbelievable. Once you try, you will never go back to an ordinary workout MAT. Silky smooth, caresses your skin as you slide from one pose into another with ease. The most sensual, luxurious yoga accessory you will own. Take it with you everywhere. ENHANCES PERFORMANCE. Extra large size MAT cushions and protects you through all your routines. Brilliant design and deep colors inspire your mood and help you perform at your peak. Sheer comfort and pleasure. Instantly relax your mind and body on this amazing, comfortable YOGA MAT. Will be the favorite new addition to your fitness gear. Excellent for public workout or the home gym. Holds up to all your most rigorous routines. Pairs perfectly with our special YOGA TOWEL for hot yoga. PREMIUM TRAVEL ACCESSORY. Soft, compact MAT comes ready to travel in its own bag. Gives you WOW factor, with all eyes on you, no matter which yoga class or gym you attend. Latex MAT pops with colorful style and attitude. Make no mistake, our YOGA MAT is the ultimate accessory for fitness and travel. Pack light, travel free and in style. EASY CARE AND CLEANING. Unique latex design keeps your fitness workouts germ-free. Simply wipe down with sponge and soapy water after each use to prevent bacteria. Store rolled up in bag, in a cool place. Elegant solution combines proper hygiene with pizazz. If you have any questions about this product by The Addicted Athlete, contact us by completing and submitting the form below. If you are looking for a specif part number, please include it with your message.